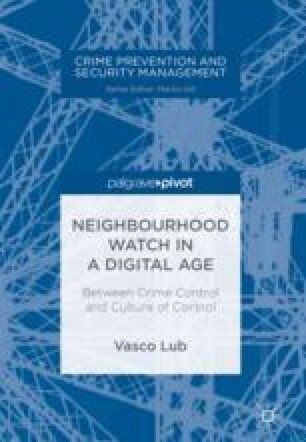 This chapter comprises an ethnographic study of the neighbourhood watch team in the district of the Kruidenbuurt in Rotterdam, the Netherlands. The Kruidenbuurt is known as an average middle-class neighbourhood. A sudden wave of home burglaries triggered the establishment of the watch team. The team patrols daily. Volunteers use modern means of communication, including Facebook, WhatsApp and the BuitenBeter app, a municipal reporting system for smartphones. The fieldwork shows that it is often unclear to what degree reports refer to actual crimes or illegal acts. False alarms are not uncommon. A learnt lesson of the team is to keep the WhatsApp groups of the team and the wider neighbourhood population separate, to prevent residents from taking matters into their own hands after reports.